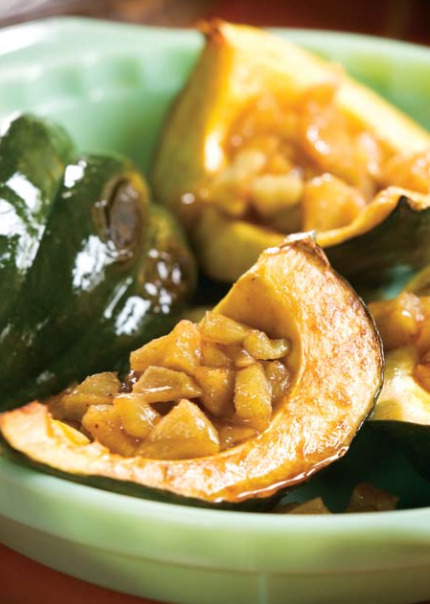 Cinnamon and cloves spice up traditional acorn squash wedges. Makes 4 servings. 1 wedge per serving. Cut squash into halves and scoop out the seeds. Place squash, cut side down, in 13 x 9-inch baking dish. Add water and bake 35 to 45 minutes or until fork-tender. While the squash is baking, cook the rest of the ingredients in a medium saucepan over medium heat for about 8 minutes or until apple is crisp-tender. Cut each piece of squash in half and divide the apple mixture equally among squash wedges. Return squash to oven; bake 10 minutes more or until heated through and serve while hot.